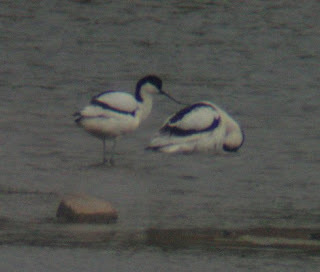 Its been a long time coming but finally after a period of 10 and a half years (10th August 1998-24th April 2009), Brockholes has had its first Avocets Recurvirostra avosetta. 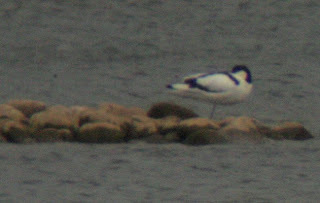 there were 3 adult birds on Main pool, first seen at 15.55 and still present by 16.50. 2 of the birds stayed together and another was to the eastern side of main pool generally roosting but accasionally looking alert and calling. 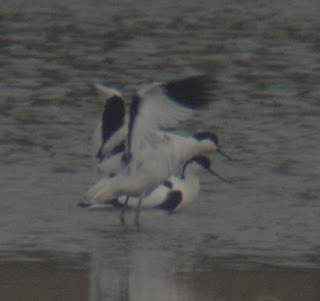 Incredibly the 2 that stayed together appeared to be 'checking out' the accomodation as though they were looking for a place to nest and the male was certainly aggresive to nearby Lapwings...oh well there goes the chance of any more rarities haha. 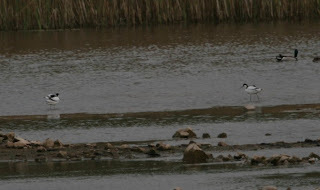 Great Birds nontheless and an extremely overdue site record.